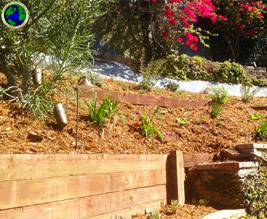 Sherman Oaks landscaper: understanding Landscaping through our eyes. In the event your landscape should need a fresh design, there are definitely advantages to looking at the project holistically. Landscape designing isn’t only about giving a lovely appearance to outdoor space but it’s also about making an appropriate use of that place. Besides enhancing the value of your premises, a lovely landscape can save you money by decreasing your cooling and water expenses. As a Sherman Oaks landscaper We consider landscaping to be an art form and our ability to transform exterior spaces into exotic landscapes that improve the attractiveness of your home is unmatched. If professional landscaping is something which you want to know more about, give us a call for a free consultation today. We use the most modern materials and supplies to provide your home the current, economical and natural look that’s required for homes in Los Angeles. We deal with irrigation systems too! The ideal way to make sure your lawn has healthy and thriving grass is to make sure the roots are plenty wet. But if your lawn is over-watered you’ll observe that it will become soggy in certain areas. If you have cracked pipes or broken or improperly placed sprinkler heads you will have dead spots. It can be difficult to understand precisely what your lawn requires without an expert’s opinion. This Sherman Oaks landscaper also installs artificial turf. Every yard is different, and we’ll show you multiple designs with different shade shrubs before you find the one which works best for you. You may opt to do a one-color floral garden or a mixture of colorful perennials. A very low maintenance landscape will make your life simpler and help you enjoy your outdoor space even more. Your yard should be a space in which you truly feel comfortable relaxing after a very long day on the job. If you would like a yard with an easy, elegant appearance, an Oriental landscape design might be the ideal fit. There are a lot of ways to dress-up your outdoor living space in Sherman Oaks, and landscaping is among them. Your front yard stipulates the very first impression that guests have of your house, so the ideal landscape design is essential. Not only are you going to get an attractive yard, but you are going to also have foliage that will endure over recent years. Decide if you would like a totally waterless yard with stone and little rocks, or a yard with a couple plants. You have to select an expert Sherman Oaks landscaper that’ll be dedicated to completing the job which you want done. Our landscaping business will have a firsthand understanding of all of the varieties of plants and trees that are perfect to mix together in one setting. We can tackle jobs of almost any size and perform any of a number of tasks to create and preserve residential jobs as well as commercial grounds. Don’t forget to check out our reviews on Houzz!